1) What is your ethnicity? 2) Do you watch Fresh off the Boat? If not, are you familiar with it? 3) If you do watch, why do you watch the show? 4) Do you agree, support, or relate to representation of Asian Americans in the show? 5) Are you aware of any other shows in the past 20 years that focus(ed) on the experiences of Asian Americans? 6) Why do you think ABC is airing a show like Fresh off the Boat? 7) If you're aware of or watch Black-ish, Cristela, or other similar diverse TV shows, do you think the reasons they are being aired is similar to or different than ABC's reasons for airing Fresh off the Boat? Howso? I sought to remain within my college community to find individuals of both American-born Chinese and Korean American identities. I approached them all under the impression that their identities, with the exception of their ethnic affiliation, would remain confidential. I then asked them the questions listed on the left, allowing them to answer as freely as they desired with as few or many words and thoughts as they wished. The results are transcribed in the Interviews: Korean Americans and Interviews: Chinese Americans tabs. In total, I interviewed 4 Korean Americans and 6 American-born Chinese. As a whole, 4 do not watch Fresh off the Boat, 4 watch it occasionally, and 2 have seen every episode. Broken down by ethnicity, of the Korean Americans, 2 do not watch, 1 watches occasionally, and 1 has seen every episode; of the Chinese Americans, 2 do not watch, 3 watch occasionally, and 1 has seen every episode. When prompted as to why they watch the show and tallying up the responses overall, 1 expressed hype, particularly within the Chinese American community; 2 cited having friends watch it as well; 2 liked the casting of the family; 2 find it funny; and 3 (all Chinese) pointed to relating to or feeling resonance with the show. When asked about whether they agree, support, or relate to the representation of Asian Americans in the show, the following responses were received. Overall, 4 Chinese Americans think it was fairly representative and that they related, while the other 2 who have not watched said their mothers do and have indicated the show to be accurate or representative of when they moved to the US. Of the Korean Americans, 1 had no real opinion, 1 saw it as a starting point, and the other 2 were skeptical that it could be all-inclusive due to the differences between Chinese American and Korean American experiences, but still found it closer than other, predominately-White shows. Thus, the Korean Americans were less excited and saw less representation. The Chinese Americans expressed that they did relate to the representation, citing similarities between the TV parents and their own. One also expressed that she connected with the characters and experiences more than other TV shows in terms of expressing her identity as an Asian American. In order to gauge the prevalence of other “Asian American” shows, I inquired if any of them were aware of any other shows in the past 20 years that focused on the experiences of Asian Americans. 9 were not aware of such a show; 1 was aware of All-American Girl, which was cancelled after only one season. Another point of interest was why they believed ABC was airing Fresh off the Boat. The reasons can be divided as profit (and, closely related, ratings) and diversity (and relatedly, that Asian Americans are rising in population numbers). 4 cited profit and rankings, and 7 cited diversity or the increasing Asian American population. Only 1 mentioned the idea that ABC may be attempting to cover up their problematic lack of diversity in past programming. As a point of comparison, I asked their opinion of two other ABC shows, Black-ish and Cristela, which focus on the experiences of African Americans and Latino Americans, respectively. 3 mentioned money and ratings, 8 mentioned diversity in some way, and 2 thought it depended on the show: for Black-ish, they mentioned a change in American sentiment and an attempt to move past racism, while for Cristela, they mentioned that the Latino population in the US has been increasing. At the beginning of this process, I sought to make an original contribution to the following question: What is the attitude of Asian Americans toward their representation in Fresh Off the Boat and the motive of ABC in airing such a show? The interviews provided insight into these questions. All of the Chinese Americans expressed relation in some way to the show, be it through family or personal experience, and found the representation to be accurate or closer than any other show. 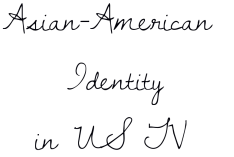 The Korean Americans saw it as a starting point, and were quick to point out that the show, which focused on a Chinese family, cannot be entirely representative of all Asian Americans. Overall, the attitude was positive and hopeful. In terms of ABC’s motive, 7 responses focused on diversity and the increasing Asian American population, while 4 mentioned profit and ratings, and only 1 brought up the idea that ABC could be trying to cover up its less-than-diverse past. Thus, overall, Chinese Americans are more positive of the representation of Asian Americans in Fresh Off the Boat than Korean Americans, but both groups were positive and hopeful; also, both groups thought ABC’s motive was largely to increase diversity, though the notion of profit was not altogether foregone.